After giving you a run-down of my makeup and skincare favourites of the past year, we're onto haircare! In 2014, I scrapped my silicone and sulphate-free haircare routine, stopped reading every ingredient list of every product I bought and went back to using products full of them. Personally, I haven't noticed a change in the quality of my barnet and my hair is as happy as ever. Now I know I just told you that I reverted back to using products that contained sulphates and silicones, but my favourite shampoo of the year was the Ojon Super Sleek Smoothing Shampoo. Even though it's sulphate-free, it creates a rich lather that gently cleanses the hair, without leaving it stripped and feeling like dry, brittle hay. As I wash my hair every other day, I find it to give my hair a thorough once over, but if you have particularly greasy hair or a lot of product build-up, then you may need something stronger. Whilst I love the Ojon shampoo, I'm not such a fan of the conditioner, as I find it a bit wishy-washy. The conditioner I have been loving, though, isn't a fancy-pants, expensive formula; it's the humble Dove Intensive Repair Conditioner. Yes, it's probably stuffed with as many superficially-effective ingredients that trick you into thinking your hair is healthy, when it isn't, but do you know what? I don't care. Whilst it isn't particularly thick or rich, it gives my hair all the hydration it needs, leaving it smooth and glossy, with immediate results that I notice as soon as I rinse it out. I'd never solely use this conditioner and I do rotate my products to give my hair some true nourishment, but this gets the top spot because it's cheap and does everything I need it to. 2014 was the year I started experimenting with using coconut oil as a beauty product, rather than just a cooking ingredient. It makes a wonderful hair mask, for when you have a bit more time to spend washing your hair. I like to warm a scoop of the oil in my hands, before slathering it onto my dry hair, focusing on the lengths and ends, especially. Then, I leave it on for as long as I can (sometimes overnight), before shampooing and conditioning my hair as usual. Depending on your hair type and how much oil you apply, you may need to double cleanse to ensure all of the oil is out of your hair. Afterwards, hair is softer, sleeker and has a mirror-shine to it and the results are just as good as any, branded, hair mask. Plus, it smells good enough to eat, it's so economical and can be used in so many ways, all over the body! MoroccanOil has to be my top hair oil of 2014. After trying so many others in the hunt to find a cheaper equivalent, I've realized that there aren't any that make my hair look or feel anywhere near as nice. Bear in mind that my hair is super long and gets a battering from my styling tools and colouring, so it needs as much moisture injected into it as possible. Not only does it make my hair feel like silk, but it also protects the hair from heat styling and significantly cuts down drying time. I can even let my hair dry naturally without any worry of looking like a banshee who's been dragged though a hedge backwards after an hour, as it totally tames any frizz or fluffiness. Whilst this is an expensive option, I need to use just one pump per application of this, whereas with others, I have to use far more. The original formula is potent stuff and it could be too heavy for fine hair, but there is a light version available. The Joico K-Pak Liquid Reconstructor gets my vote for leave-in conditioner of the year, as it's effective, yet light. My hair never feels weighed down after using it, no matter how liberal I am with my spritzing. Helping to restore amino acids, which are essential proteins that strengthen the structure of hair strands, this spray prevents hair from becoming weak and breaking off. I've had my bottle for months and it's showing no sign of becoming empty any time soon! I've never really been into dry shampoos as I wash my hair so often (one of my new year resolutions is to cut down!). But, when Ruth Crilly's Colab Dry Shampoo was released and there was such hype about it, I made a purchase. Whilst it's great at absorbing excess oils and smells from the hair to extend the amount of time between washes, it also acts as a body booster, giving roots a bit more oomph and the lengths some extra body. It's completely invisible and leaves no chalky, gunky residues behind, so it can even be used in the blackest of hair. With six, different scents on offer, all of which smell divine, there's one to suit every taste and at less than a fiver, the large cans are an absolute steal! Whenever I wanted to give my hair a volume boost, I consistently turned to the Charles Worthington Volume & Bounce Texturising Spray, which is a drugstore dupe for the much-coveted, but extortionately-priced, Oribe Dry Texturising Spray. When hair's freshly washed, it can be a bit too slippery to style easily and the roots can look a bit flat. This spray plumps up the hair and adds texture, which makes it a great product to prep with, before creating an up-do. A great alternative to backcombing, this won't cause any damage to the hair, but still gives amazing hold. Lasting all day and night, if hair starts to drop, you only need to rough up the roots again and that initial volume will be brought right back. It's genius stuff! A product that I definitely couldn't leave out of my line-up, is the Schwarzkopf got2be Weightless Dry Oil Mist. 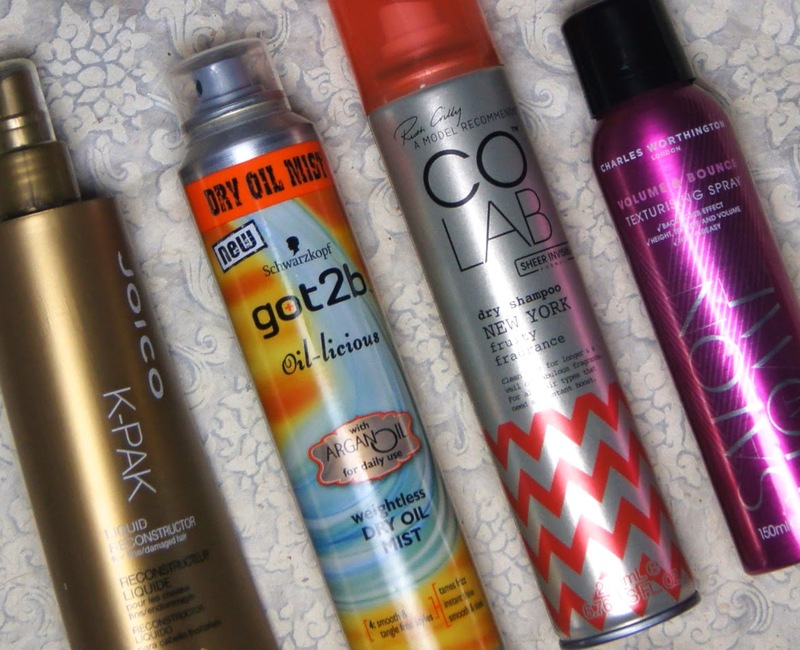 To keep fly-aways at bay and get sleek, shiny locks, this spray is a godsend. Not only does it do a stellar job at creating a fine mist of product, but I'm absolutely addicted to the fragrance of it. As the bottle says, it's totally weightless and doesn't feel heavy at all, making it a great option for those that find liquid oils make their hair lank and greasy. I find it best to spray a little into the air and then swish my hair into it, rather than aim directly at my head. It's the ideal finishing spray for when you're in a rush and need to combat any hair craziness as quickly as possible. 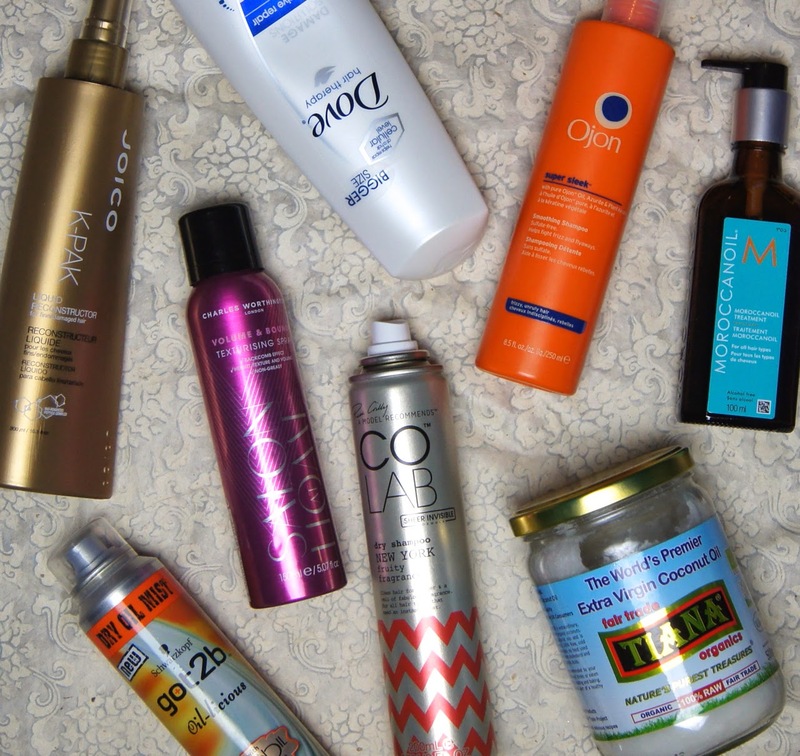 What were your haircare favourites of 2014? I picked the Charles Worthington Texturising Spray for my favourites of 2014 too! I love it, it's not too damaging. I'm yet to try any of this, I think I may need to pop to the shops and pick a few bits up now though! Thanks for sharing and thanks for sending your link over in the twitter chat!